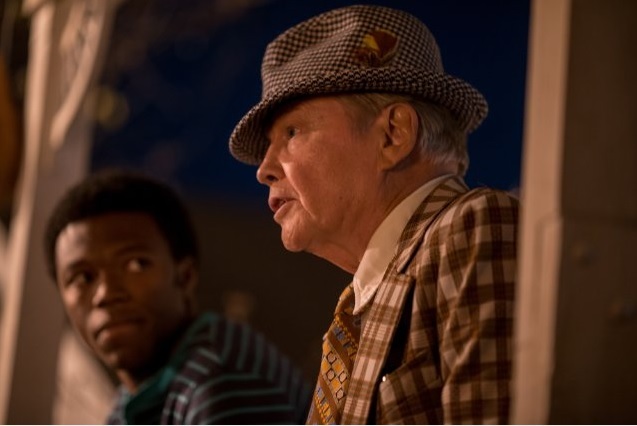 Caleb Castille & Jon Voight in a scene from “Woodlawn” , in theaters on Oct. 16th. “Where are you living from?” asks Junior Nathan to his son Tony. The young man taps his fist to his heart, and so begins the emotional true story of “Woodlawn”. The film portrays the events that unfolded at Woodlawn High School in the early 1970’s in Birmingham, Alabama. Woodlawn is going through the transition of desegregation, and is experiencing severe clashes between the races. It was on the verge of closing, until a spiritual revival–popular in other cities at the time—came to Woodlawn when evangelist/sports chaplain Hank Erwin offers an invitation to the Woodlawn football team to live another way. Let me just say up front: this is not a movie that will tap dance around with some vaguely Christian/ religious message. Early and often, filmmakers Jon and Andrew Erwin (the real Hank Erwin’s sons) want you to know: Jesus is the way…the only way, and they make no apologies for it. As a Christian, this doesn’t bother me and I appreciate seeing a movie where there are lots of characters in real situations– each in their own personal stage of believing or not believing. It’s a refreshing change from the usual portrayals of believers that Hollywood gives as hypocrites who are either impossibly good or unbelievably bad. Hank Erwin is played very convincingly by Sean Astin (“Lord of the Rings”, “Rudy”), who has become a familiar face in faith-based films in recent years. Whether Astin is a Christian or not, he does an exceptional job in his role persuading others why they should be one and how loving each other can restore unity to the school and the city. One of his most powerful scenes comes at the end at the pre-game prayer rally when Woodlawn is playing their biggest rival, Banks High School. That’s all I’ll say about that scene because if you want to know what happens…you just have to see the movie. Another veteran actor –and an Academy Award winner no less– has a prominent role in this independent film. Jon Voight (“Coming Home”, “Midnight Cowboy”), who plays the legendary University of Alabama coach Paul “Bear” Bryant, is both poignant and humorous in his portrayal of the man who tirelessly pursues Tony Nathan to play for his team. Nathan is a young man with a talent for running who, in the midst of the racial turmoil around him, becomes a star athlete at Woodlawn. Newcomer Caleb Castille holds his own against the more seasoned actors in the cast with no problems. His Tony Nathan goes from being a soft-spoken football player with doubts about being in a school where he’s not wanted, to being a courageous team leader. If his performance in “Woodlawn” is any indication, Castille has a bright future in films. Since the story is often told from the point of view of Woodlawn head coach Tandy Gerelds, I don’t want to overlook the work of Australian actor Nic Bishop (“Body of Proof”) in that role. His scenes with Castille are some of the most touching in the film. Kevin Sizemore (“Transformers: Dark of the Moon”) is his right-hand man Jerry Stearns, who often provides some much-needed comic relief. Speaking of which, Sherri Shepherd (“The View”, “One for the Money”) gets in some great one-liners as Tony’s feisty mother Louise, and fans of ‘80’s films will recognize the familiar face of C. Thomas Howell (“The Outsiders”, “Red Dawn”), who plays George “Shorty” White. White was the coach of Woodlawn’s rival team Banks High School. In Howell’s hands, White is an over-the top character that lives and breathes football and gives the film some of its lighter moments. Without a doubt, “Woodlawn” is a very ambitious film. There’s a lot going on here, aside from the obvious issues of racism, desegregation and faith. It touches on prayer in the public schools, domestic abuse, and facing fears head-on—lots of big life stuff. One very important point made is the relevance of fathers (and father figures) in the lives of young people, and how the lack of such relationships can negatively affect them. This is best shown in Tony’s relationship with his father (played by talented actor Lance E. Nichols) and Coach Gerelds, compared to his girlfriend Johnnie (Joy Brunson) who comes from a home with an abusive father and no mother. In a culture where parents—especially fathers—are ridiculed and made to look unnecessary, it’s good to see a film where strong men are raising their sons to be responsible to their families, to each other and to their community. If you plan to see this movie, try to do so on opening weekend (Oct. 16th) because a strong showing at the beginning gets Hollywood’s attention and makes it more likely that films like “Woodlawn” will stick around and more will be made, as in the recent success of “War Room”. You don’t have to like football (I don’t) to appreciate the message of “Woodlawn”. Some of the most inspiring films seem to revolve around it (“Rudy”, “Remember the Titans”). Next weekend, “Woodlawn” will join that distinguished list. ***NOTE: For more about this film, see last week’s posting on the making of “Woodlawn”. The creator of one of the highest-grossing documentaries in box-office history has paired once again with an Academy-Award-winning producer to bring another unsettling scenario to the big screen as we prepare to celebrate America’s 238th birthday. 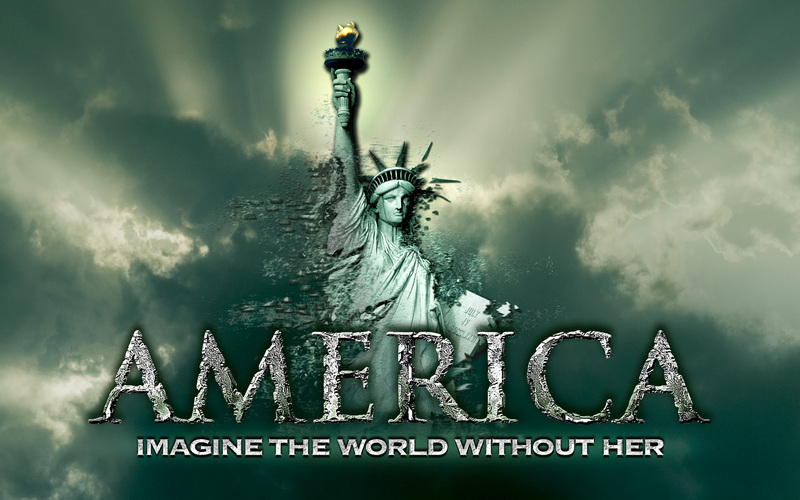 The film first faces the critics of America head-on by breaking down the arguments that the radical left has made against this country: it was founded on racism, genocide, oppression and theft. These beliefs are behind their desire to see the country get taken down a few pegs—to a point where we’re no longer a leader in the world. D’Souza interviews those who hold these beliefs (and have passed them onto younger generations), like Ward Churchill. He was a college professor best known for his disparaging remarks about the victims of 9/11 shortly after that event. Sitting through this portion of the film gave me some idea of what it must be like to be a conservative student on nearly any college campus today, where history, economics and pretty much any other subject are presented from the point of view of the left. This was really a strong point of the movie. By setting up the fact there’s been an effort among many in our society who wish to undermine the American idea—and backing it up with interviews—D’Souza shows us that not everyone who lives here or who was born here loves it here. This is important to establish up front, as he then goes one by one, refuting each claim made against America. He does this quite well using news clips and more interviews that give the story of America the balance it deserves. America isn’t just a series of news clips and sit-down interviews, however. Dramatic re-enactments are used effectively throughout the movie to bring moments in history, and those who made history, to life. We see General George Washington commanding his troops; President Abraham Lincoln giving his last speech before being gunned down by an assassin’s bullet; former slave-turned-abolitionist Frederick Douglass, and the experience of one Vietnam POW at the Hanoi Hilton. D’Souza and co-director John Sullivan (2016: Obama’s America) are skilled storytellers, as they bring the audience into the past, all the while making connections to today. Anyone who may not be familiar with the teachings of Saul Alinsky will come away from this film with a better understanding of who he was and how his radical views have come full circle in the current occupant of the White House, as well as the woman who hopes to follow him (Hillary Clinton). America is a feast for history lovers, but it’s also got a great soundtrack. Stay through the end credits and enjoy an uplifting—and rocking—new version of “The Star-Spangled Banner” by a group I’ve never heard of called Madison Rising. They call themselves “America’s most patriotic rock band” and it’s worth sticking around for a listen. You may even want to download it to accompany you on your Independence Day Weekend activities. “I was alone, but I wasn’t afraid.” With those words, 4-year-old Colton Burpo begins to tell his father Todd what he saw as he lay on an operating table as doctors worked feverishly to save his life. He sees the doctors working. He sees his parents. And he sees heaven. What Colton reveals of heaven sets off something of a firestorm within his town, and especially within his family, as his father—a small-town preacher, fireman and businessman—tries to come to grips with his own questions of faith and what is really real. Based on a true story from the best-selling 2010 book of the same name, “Heaven Is For Real” * is a beautiful film from a cinematography standpoint, with lots of sweeping views of Nebraskan farmland and crystal-clear starry nights (though according to the credits, it was shot in Manitoba, Canada). The glimpses of heaven that we see are surprisingly subtle. Many times when Hollywood attempts to deal with the topic of heaven, we get over-the-top, swirling dry-ice-induced fog and puffy clouds, surrounding Christmas-tree angels with harps and golden wings. If you were planning to avoid this movie because you want to avoid the typical campy, clichéd images we’ve become accustomed to, you can be rest assured you won’t find them here. The closest it comes is the heavenly choir singing, but even that is offered up with some humor when young Colton requests his favorite song. That draws giggles from the choir, but I won’t give away what the song is—just go see the movie. Academy Award-nominated and Emmy Award winning actor Greg Kinnear plays the hard-working Todd Burpo. He is believable and gives a poignant performance as a pastor facing multiple personal crises—then has to decide what to do when his son begins to tell him about his visit to The Other Side, and of meeting loved ones he could never have known. 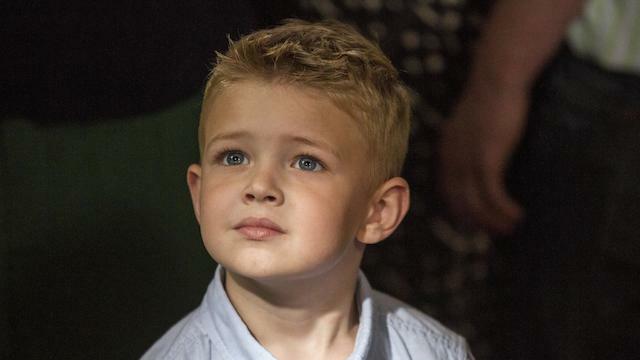 His scenes with the young actor who plays Colton, 6-year-old Connor Corum (making his film debut), are some of the most memorable and touching ones. The young actor, with his sweet, innocent face, delivers his lines in such a way that it reminded me of why Jesus said we should all be as little children in matters of faith. Colton tells his dad everything and everyone he saw in heaven in a very matter-of-fact way. Sort of like, believe me or don’t…but this is what happened. Of course Todd, being a preacher, wants to believe him. After all, he’s told his flock about heaven many times, but when he finally decides to tell the congregation, the results aren’t what you might expect. Each one, after all, has his or her own issues and struggles to really believe. In fact this is one of the many strong points of the film. I like how it showed the ups and downs of “church-going people”. When Colton needs emergency surgery, his mom (played by Kelly Reilly) calls one church member, who then sees to it that the word is spread to pray for this family. Later on, after Colton’s ordeal and his stories of heaven get around, some of Todd’s faithful congregants become uncomfortable with this literal heaven Colton describes. It should give some encouragement to people—whether you’re a church-goer or not— to know that even a pastor, or a pastor’s wife or a church board member can have a crisis of faith when faced with the reality that heaven is real. It’s easy enough to talk about heaven and God when they just seem like stories to make you feel good from time to time. But what do you do when life happens, and you’re faced with impending death, or in this case, near death? When you hear the real experiences of real people like Colton Burpo, or you sit beside the bed of a dying loved one, what do you believe then? I saw “Heaven Is For Real”* yesterday, on Good Friday. Even though it was the early afternoon, it played to a packed theater full of people of all ages. Most people, whether they believe in God or not, have a yearning for something beyond themselves, and a hope that what we can see in this world isn’t all there is to life. It was appropriate this film was released during the Easter season. It inspires, encourages and challenges you to open your eyes, to live without fear…to have faith. If you don’t care much for football, don’t even know who’s playing in the Super Bowl, or you’re just dreading what Punxsutawney Phil’s prediction will be tomorrow…this may be a good weekend to check out the newly-released film, Gimme Shelter*. The story follows her on her quest to find her birth father, whose only contact with her came in the form of a letter that he sent to her before she was born. Her father Tom, played by Brendan Fraser (The Mummy), is now a wealthy Wall Street guy living in New Jersey with his wife and two young children. They agree to help her, but when they find out she’s pregnant, they want her to end her pregnancy. Her father tells her to “turn the page” and put “this” behind her. When Apple refuses to do that, she ends up back out in the streets. However, even in this darkest of dark times, she prays to God for help. While these brief mentions of God and the Bible may be enough to turn off some people, the film is definitely not preachy. Just as Father McCarthy is non-assuming in his dealings with Apple, this film brings a very life-affirming and hopeful message without beating the audience over the head with it. Apple begins to learn to trust, and with Father McCarthy’s help, finds shelter in a home for young un-wed mothers and mothers-to-be. The shelter is run by Kathy Difiore (Ann Dowd), the woman on whose real-life story this movie is based. It’s here where she begins to face the truth about herself and her life through the bonds she develops with the other girls in the house. Even as she learns to live in a more stable setting, her old life keeps trying to drag her down as her junkie mother refuses to let her go. There’s a lot going on in this film, and it’s extremely well-acted and directed. So many of the movies coming out of Hollywood take stories like this and wallow in victimhood, darkness and hopelessness— never showing that something good can still happen even in the worst situations. While Gimme Shelter doesn’t shy away from showing the grim hopelessness of a life on the streets or a life of growing up in chaos, it doesn’t stay there. In fact, director Ron Krauss had a hard time getting this movie out. Krauss told National Review that he faced criticism from the Hollywood machine and tried for a year to get this movie in theaters. He said, “A lot of people in Hollywood actually went out of their way to make sure this movie would not come out. People tried to pay me off”. Fortunately for us, the movie is out and it’s message of what love can do to change lives, hearts and futures is out there for anyone who wants to see it. If you’ve ever asked, “Where was God when____?”— this movie is for you. But bring Kleenex…lots of it. He is the man who almost single-handedly created the television genre of reality TV with successes such as Survivor, The Apprentice, Celebrity Apprentice and The Voice to his credit. She is an Emmy-nominated actress best known for her role as Monica on the long-running hit series Touched by An Angel. Together, this husband and wife team has brought a fresh re-telling of some of the greatest stories ever told in The Bible, a ten-hour miniseries that began last night on the History Channel. Mark Burnett and Roma Downey decided four years ago to bring these stories to life for a new generation. As co-executive producers, the two have spent the past several months promoting the series and partnering with churches to get the word out that The Word is coming back to television. Burnett told the Associated Press he believes there is a “Biblical illiteracy” among young people today. They wanted to create a series that would touch people’s hearts, but they also wanted to “make it cool”. It appears they have succeeded on both counts. The first episode alone covered Noah (who gives a brief re-telling of the Creation story), then moves into the lives of Abraham, Moses and Joshua (the adventures of Joshua will continue in the 2nd episode). The first installment featured The Flood, the destruction of Sodom and Gomorrah, Abraham’s willingness to sacrifice his son Isaac, the Burning Bush the parting of the Red Sea, the Exodus and the Ten Commandments. That’s quite a bit to cover in just two hours, but the fast pace holds your attention. The special effects are well-done and the soundtrack adds to the epic feel of it. Some elements of reality television are present, such as the use of time-lapse video to show time quickly passing—that’s become almost a staple of reality TV, in fact—but I wouldn’t say it was over-used, at least not in the first episode. Most of the actors are unknown to American audiences, with the exception of Downey who will portray Jesus’ mother Mary in her later years. The cast is very international and cross-cultural which should lend to its appeal to audiences around the world when it eventually is shown elsewhere as the producers are planning. 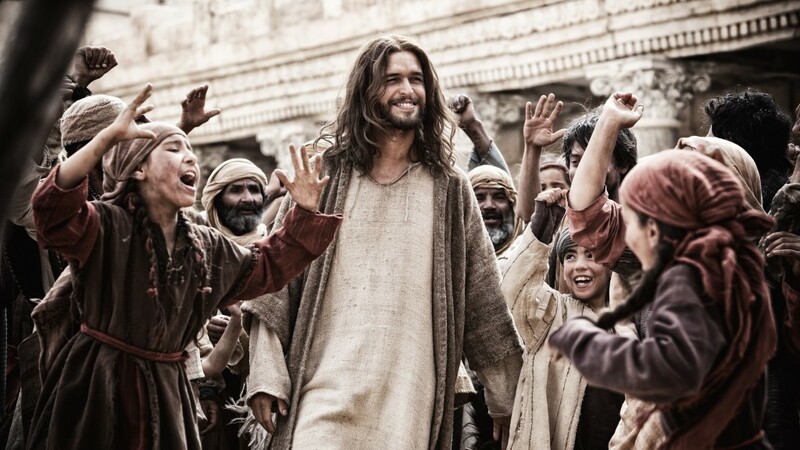 For right now, the miniseries will be shown here in the U.S. and in Canada with 4 more episodes airing each Sunday night on the History Channel through Easter Sunday, and repeating each Monday evening on Lifetime. You can check out some clips of the series on their website to check it out for yourself, but I plan to keep watching because I believe it’s important to support projects like this. As for children, parents are recommended to treat this as they would a PG-13 film and make that judgment for their own children. Some scenes may have violent and graphic content. If you’ve read Rage, you know that it presents the premise that the reason why Obama has made decisions that seem contrary to the good of the nation to many of us, were made by him based on his being raised to believe that the West, and America in particular, needs to be brought down in order to “get even” for what he sees as the evil of our colonialism and exploitation of the Third World. Why else would he shut down domestic oil drilling, but promote it in places like Brazil? As the film explains in shocking detail, it’s all about re-distributing wealth—not just from one American to another, but from America to the Third World. In other words, in Obama’s global vision, YOU, America, are the evil One Percent. 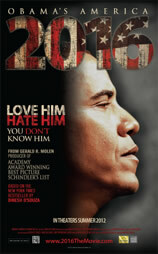 The film attempts to understand Obama’s mindset by travelling to the places that affected him as a child. It goes to Indonesia, where he spent a good portion of his childhood and to Kenya, where his father (a man he hardly knew) came from and where he developed his anti-colonial/ anti-West views. While in Kenya, D’Souza sits down to talk with a man we’ve all heard of but have rarely seen: Barack Obama’s half-brother, George Obama. This was one of the most interesting parts of the film. Although living in extreme poverty in a tiny hut in Nairobi, George Obama holds no expectation that his wealthy and powerful older sibling should do anything for him. Nor does this member of the Obama family hold the same anti-colonialist views as his father and half-brother in the White House. In fact, he discusses the differences between other nations such as Malaysia, Singapore and South Africa that were once on a par economically with Kenya. He says now those nations are practically developed, while Kenya still continues to struggle—so it was not, he believes, colonialism that has held Kenya back. As you would assume in a film called “2016”, predictions are made for the future, based on what has already been. It’s pretty frightening too. The film reminds us of the candid conversation between President Obama and Russian President Dmitri Medvedev, when Obama (caught on an open microphone), told him he needed “space” and “After my election I have more flexibility” to deal with things like missile defense. The film tells us the sad truth: when Obama entered office, we had 5,000 nuclear warheads. Now we have 1500- his goal is to take it down to 300! All the while, the other nations of the world (China and Russia) are kicking theirs into high gear- and Obama has done nothing to stop Iran from getting nuclear power. Providing for the common defense is one of only a handful of things the Constitution says the federal government is supposed to do, yet in 2016, if Obama has his way, America will be a much weaker, more mediocre nation- just another nation among the nations of the earth. But the film doesn’t leave us without some hope. D’Souza leaves us with the knowledge that what happens in 2016 is not up to Barack Obama- it’s up to We the People. Are you registered to vote? If you’re a fan of old sitcoms, you may be familiar with Kirk Cameron. Back in the mid- to- late ’80’s, he was a teen star on ABC’s hit show Growing Pains. As an adult, his work has taken a much different path than many actors with his latest project, a documentary called “Monumental: In Search of America’s Treasure”. Normally I don’t write reviews of movies here, mostly because I just don’t go see them. However, I found this one to be better than many historically-based documentaries. To begin, “Monumental” presents the problems our nation is facing today- massive debt, families in decline, loss of morality, government spending, etc. The film doesn’t blame any person or party, for America’s problems are mostly a “heart problem” that no one seems to know how to fix. The question presented in the beginning was, “What can we do?” Cameron and his crew attempt to find an answer by going back to the basics of our nation’s founding. Their travels take them to England and Holland to explore the lives of the people we call “pilgrims”. The film holds the audience’s interest by not getting too bogged down in dates and names and who did what and when- all the things that most people find boring about history. Far from boring, Cameron speaks with people who are experts on the puritans and what they were dealing with as subjects of a tyrannical king. We learn how this relatively small band of men, women and children became spiritually aware upon the first English printing of the Bible. Their desire to serve God as they chose, free from the Church of England, made them outcasts and could have cost them their lives. The film takes us through their trials in England, then Holland, then back to England, and finally on their journey to the New World. We come to understand their obstacles in a way most of us have never been taught, and hear stories of how God was faithful to uphold them through it all. Cameron walks where they walked, right down to the prison they were thrown into for their faith. By the time the film moves on to Plymouth, the viewer already has a greater respect for these pilgrims, who were so focused in their faith and hung onto the belief that God would use them to one day bring the light of truth back to their homeland. Gone are the stereotypes of these pioneer families. They were so much more than the stoic, starched creatures in black and white that we learned about in elementary school. These were some hard-working, persevering people with a plan to settle in a new land where they could worship freely. Cameron continues his visits with historical experts and points of interest, including a monument most of us have never even heard of because, for some reason, it’s been lost to history. The National Monument to the Forefathers in Plymouth, MA is referred to in the film as sort of a “Matrix of Liberty”- how the pilgrims ordered the civil society based on eternal truths, such as faith, morality, justice, mercy and education. Our forefathers believed these basic truths to be the best way to live a peaceful, happy life together. This beautiful monument is the largest granite monument in the nation and lies in a park near a residential area that didn’t look as if it were a big tourist attraction. I would imagine this movie will draw more sight-seers to view this testimony them and to the faith on which our nation was founded. I think this movie is a call to action, especially for those who consider themselves to be Christians. At the beginning of the film, Cameron expressed some frustration that he finds in other Christians when he talks about how we can turn things around. He said people tell him that as things go downhill, that’s a sign we’re getting closer to the end and these things “have to happen”. His concern is for his children and their children…what kind of country will they have to live in if we don’t do all we can to turn things around in our time. We must be, as those pilgrims were, men and women of liberty. We were all born in this time and in this place for a reason. I believe God will hold us responsible for what we didn’t do when it was our turn to stand for our nation in its time of need. 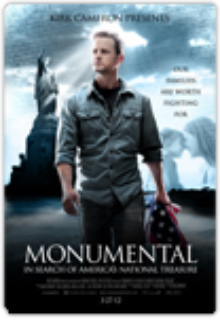 One thing you can do is watch this film, and you can do that by bringing it to your area at www.demandthemovie.com/monumental/. Then, spread the word, because “Monumental” the film is just the beginning. ***NOTE: As of 3/16/13, the website above is now defunct; You can order the movie on DVD at my Amazon Affiliate Link HERE.